Mala Sharma handles the firm’s Personal Injury and Civil Litigation cases. She also practices Family Law. Mala is dedicated to the best interest and well-being of those she represents. As such, she advocates for the best outcome and success in our State Courts. She is also licensed in the Federal Southern District of Texas. A native Texan, Mala was born and raised in the Houston area. She graduated with Honors from the University of Houston main campus and received her Law degree (J.D.) from Southern Methodist University Dedman School of Law. Mala has also studied law at Oxford University in the United Kingdom. Mala has also studied Spanish at the Universidad de Alicante and is fluent in the Spanish language. 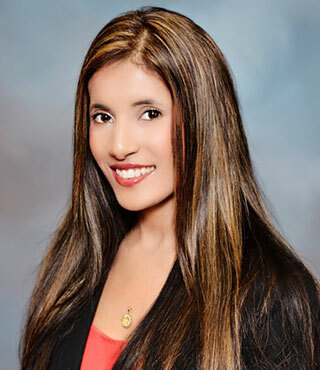 Mala dedicates her passion towards helping her clients feel satisfied in all outcomes of their cases. There are many complexities in the law from first party, third party, PIP, UM/UIM, subrogation claims, and property damage claims that need the assistance of an attorney. Mala advocates for the best outcome, in the best interests of her clients. For example, when an insurance company denied coverage where the negligent driver was excluded from the car insurance policy and had caused a near fatal accident leaving her client in a coma, Mala fought and won, through thorough and diligent research, full policy limits for her client when the insurance company would not have paid a penny, otherwise. Mala has been the past President of the Houston Northwest Bar Association (HNWBA) for 2016-2017, past Vice-President of the HNWBA for 2015-2016, and prior board member of the South Asian Bar Association. Mala holds leadership positions with the American Bar Association GP Solo & Small Firm division and is a board member for the Houston Trial Lawyers Association. She is also an active member of the Houston Bar Association, Houston Young Lawyers Association, South Asian Bar Association, Texas Bar Association, Association of Women Attorneys, Texas Trial Lawyers Association, and Harris County Leadership Council. Mala also practices and teaches yoga when she is not practicing law. She also takes care of the office pet, Milo Sharma, who greets clients in Spanish and English.